The Inspiration Clan showcasedÂ LuminousÂ Â on their website profiling 4 projects. Project 1,Â Caramel Loves Chocolate is aÂ personal project they’veÂ been working on. 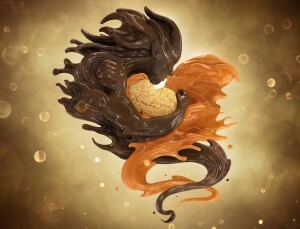 Itâ€™s about fluid dynamics, about color, about tasteâ€¦about chocolate and caramel in a loving embrace. Project 2, De Persgroep was a fun project in collaboration with photographer Jaap Vliengenthart. Â Wonderful images with creative retouching. Project 3, Â Lake Avenue in collaboration with photographer Cade Martin. Â Martin photographed the house on the island in this beautiful vista. Â Luminous created the extra elements – the pontoon plane, the docks and the porch in CG. Project 4, LuminousÂ working with TAG Media in Canada created the poster used for the Canada Motorcycle Show. TheyÂ creates and designed a generic motorcycle that was encapsulated in a thick layer of ice that was slowly melting and revealing the motorcycle. This was meant as to visually emphasize the show was nearly there and the time for riding bikes was up and coming! LuminousÂ created the motorcycle in CG and sculpted the ice layer on top of that. Afterwards theyÂ created the background from various inputs and integrated everything together.